with the Best Periodontists and Modern Technology! Have you noticed that you have lost some gum tissues? It is not your imagination. Receding gums (gingival recession) are an unfortunate symptom of periodontal disease and can be the result of many other factors and traumas such as crooked teeth, bruxism, or overly aggressive tooth brushing. When recession of the gingiva occurs, the body loses a natural defense against both bacterial penetration and trauma. Gum recession causes the tooth root to be exposed and often results in root sensitivity to hot and cold foods as well as unsightly appearance of the gum and tooth, which ultimately leads to root caries and gouging. While restoring your receding gums may not strike you as critical to your health, your gums do provide you with a barrier to infection and decay that should be repaired by gum grafting as soon as possible for optimal oral and overall health. Gum grafting will cover the exposed roots to protect them from decay, help reduce tooth sensitivity, and improve the aesthetics of your smile. Whether you have a gum graft to improve function or aesthetics, you’ll probably receive the benefits of a beautiful new smile and improved periodontal health. 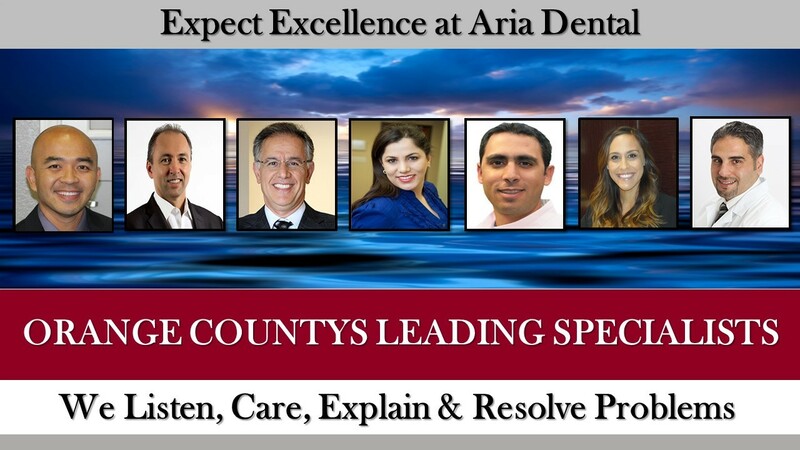 When significant gum recession is a problem and reaches the mucosa, gum reconstruction using grafting techniques at Aria Dental with our board-certified periodontists is your best option to achieve your new beautiful smile. We invite you to call us (949) 364-9600 or to book your consultation appointment. Every case of gum recession is slightly different, thus, there are various treatments available. The nature of the problem which originated the recession needs to be addressed first. If your gums are eroding due to overly aggressive brushing, a softer toothbrush and brushing technique need to be used. If oral hygiene is the issue, professional dental cleaning (prophylaxis) may be recommended to treat the gum pocket from debris and bacteria. After addressing the cause of the gingival recession, cosmetic or restorative procedure may be recommended. There are two excellent ways to restore natural symmetry to the gum and make the smile aesthetically more beautiful: gum tissue regeneration and gum grafting. Subepithelial Connective Tissue Graft – This procedure is commonly used to treat and cover exposed roots. During the procedure, a flap of skin at the palate is removed for access to tissue under flap called subepithelial connective tissue (graft tissue). Then subepithelial connective tissue is relocated and stitched to the gum tissue surrounding the exposed root and the flap is stitched back down on the palate. Free Gingival Graft – This procedure is often used to thicken gum tissue. A layer of tissue is removed directly from the palate or another donor surface without making a flap and attached to the area affected by gum recession. This method is used mostly in people who have thin gum and need additional tissue to enlarge the gum. 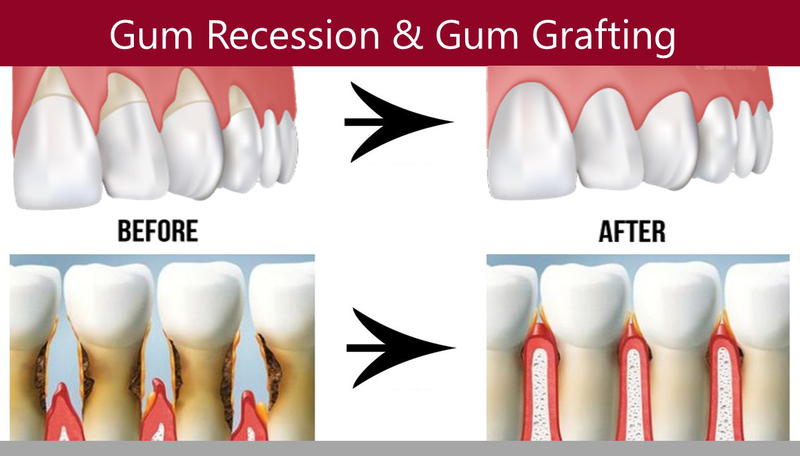 Both gum and graft side will heal without any permanent damage. Acellular Dermal Matrix Allograft – This procedure is commonly used to cover exposed root by using medically processed and donated human tissue for the graft. Pinhole Surgical TechniqueTM (PST) – The Pinhole Surgical TechniqueTM corrects receding gum but instead of transferring tissue, it utilizes the gum tissue at the treatment site by loosening the tissue that holds your gum tissue above a single tooth and gently lowering it to cover an exposed root. Thus, no scalpels or stitches needed.